I’m so easily distracted, my creative mind never seems to switch off. The other week whilst I was making my salvaged wood Christmas tree, an old wooden table hiding at the back of the garden caught my eye. I was compelled to do something with it. I wanted to turn it into some form of Christmas wall art. So, of course, everything else fell by the wayside that afternoon. I didn’t even stop to cook dinner. We ended up with a takeaway for tea. I was on a roll and had to upcycle that tabletop straight away. My three main crafting obsessions are denim, maps, and Marimekko. 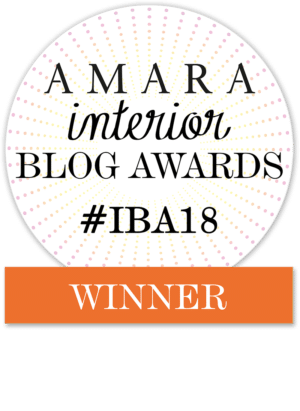 Marimekko won this time! 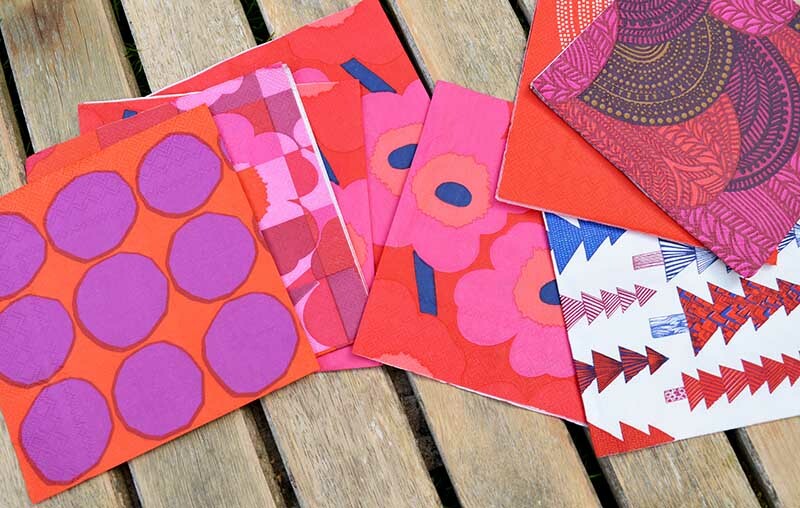 I already had a stack of gorgeous Marimekko paper napkins in lovely Christmasy reds. The table top was a perfect base to decoupage with these napkins. It really showed off all the lovely Marimekko designs. 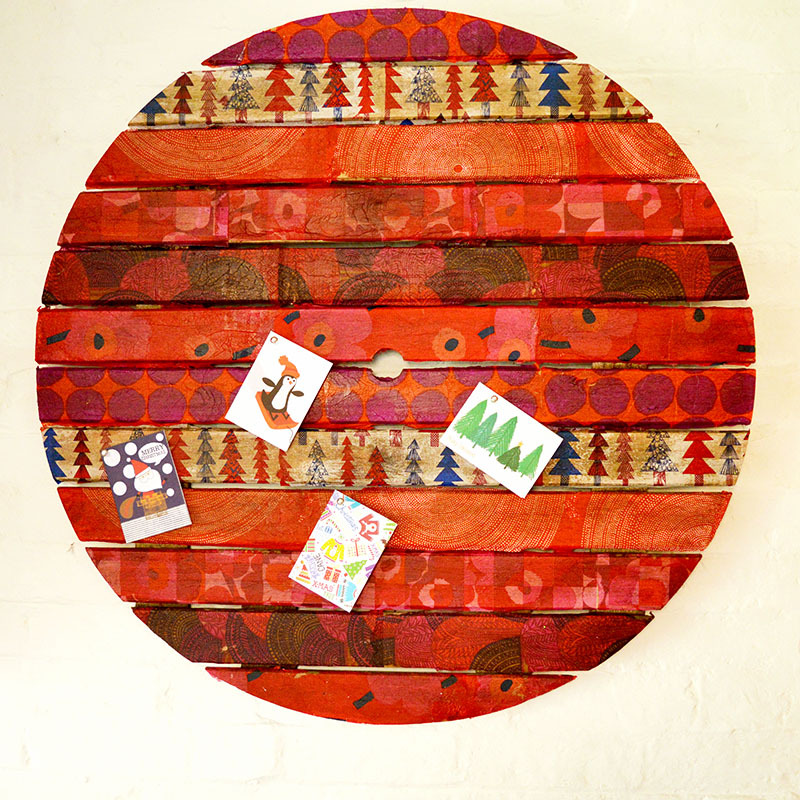 Creating a lovely piece of Christmas wall art with a mid-century modern feel at the same time. 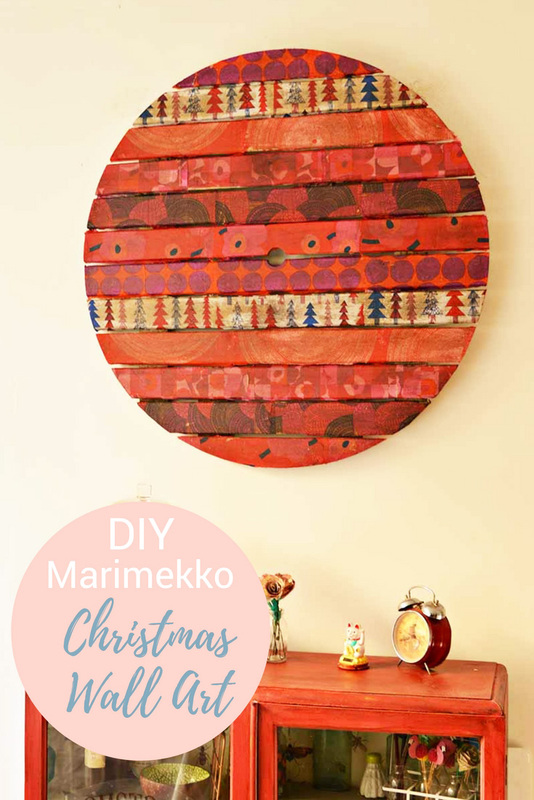 It was fun making this Christmas decoration and I think it looks like a great big Marimekko moon. It is certainly a striking piece of Christmas wall art. I could even use it as a Christmas notice board to pin my Christmas cards on. Or I could add hairpin legs and have my very own Marimekko Christmas coffee table. What I do know is that I absolutely love it. And will be hanging it on my wall as a unique piece of Christmas wall art. It looks fabulous in my dining room with my red chalk paint cupboard. 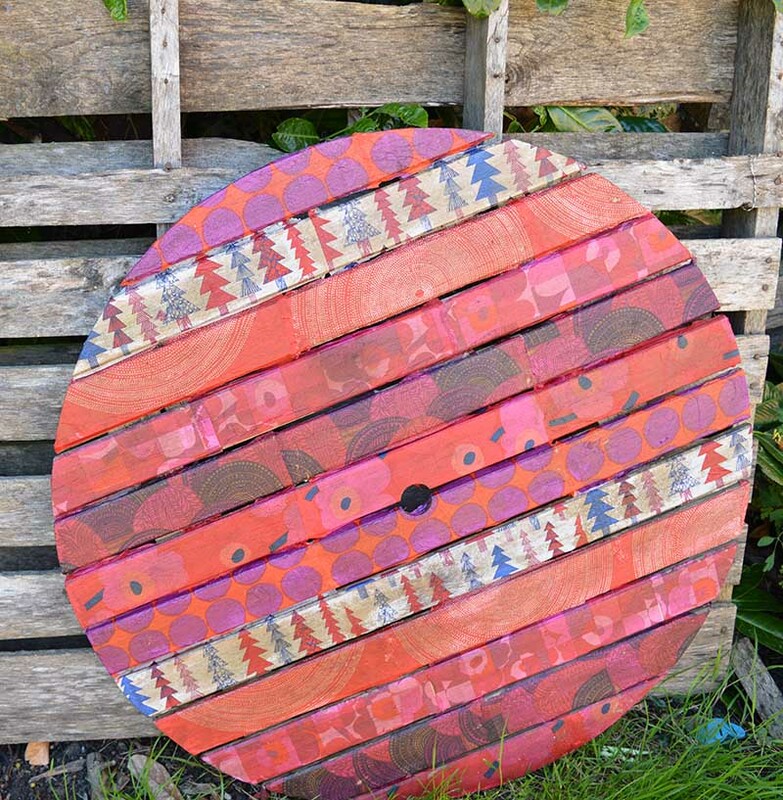 Large round piece of wood- I used an old garden tabletop, but you can use any piece of round wood. 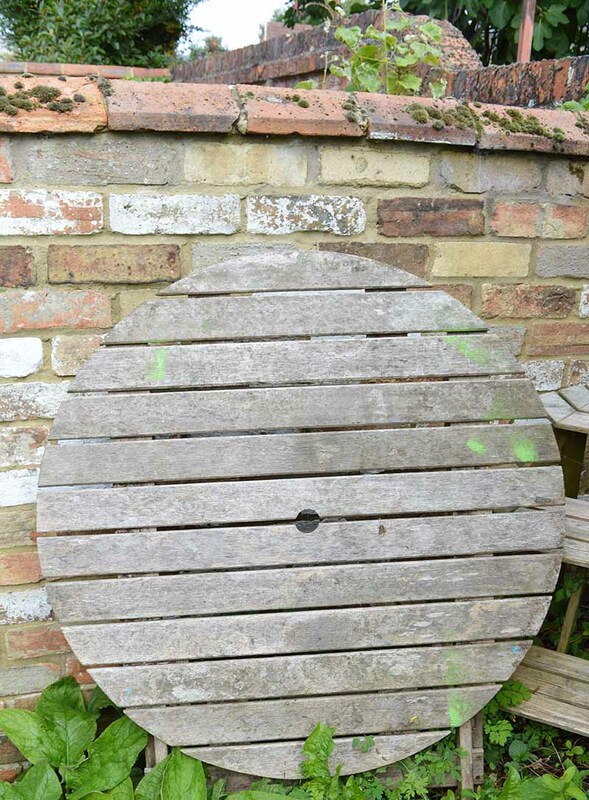 Like the top of a cable spool. 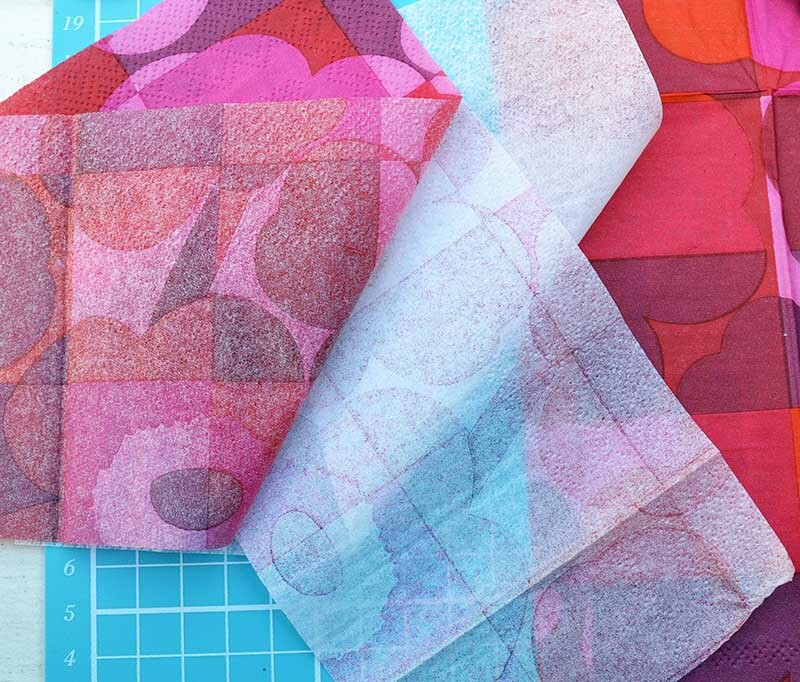 An assortment of paper napkins – I used Marimekko paper napkins in Christmas colours. I used no more than 2 paper napkins of each design. There are some shops on eBay where you can buy a few paper napkins at a time specifically for decoupage rather than a whole packet. 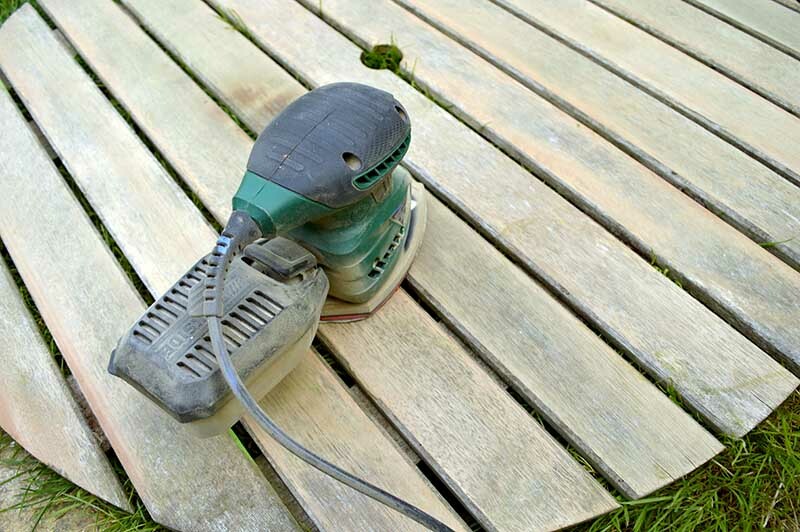 Firstly, sand the table top with an orbital sander. Once the table has been sanded and wiped down it is ready to decoupage. Secondly, prepare the napkins for the decoupage. Most paper napkins are 3 ply. Separate out the ply’s, as only the top ply is used. Cut the napkins into manageable pieces. For this tabletop, I cut the napkins into strips the same width of each wood plank. 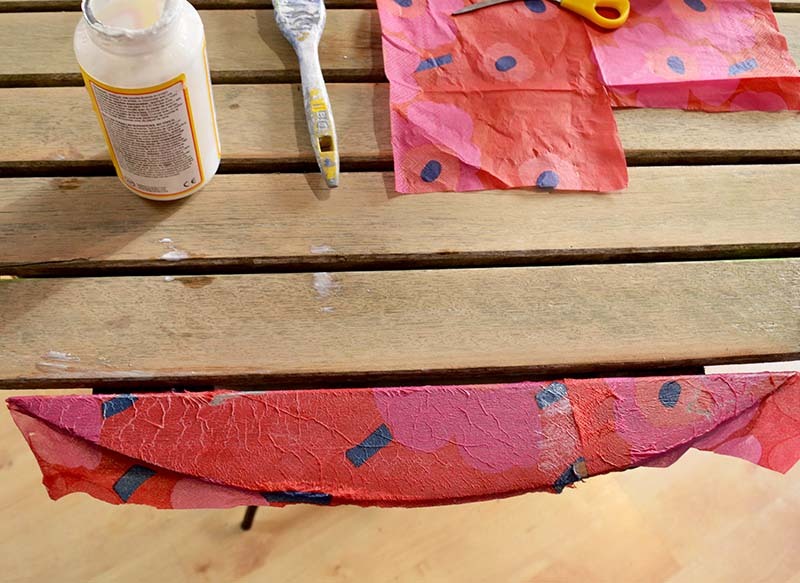 Apply the Mod Podge to the wood and not to the paper napkins. Carefully lay the napkins down onto the wood face up. To smooth out the napkins, screw up the unused ply’s of the paper napkin into a ball and cover with clingfilm. Use this clingfilm ball to smooth out the napkins by pressing down on them with it. The clingfilm doesn’t stick to the paper napkins so reduces the chances of it tearing. Carefully apply a layer Mod Podge onto the top of decoupage napkins this will provide a protective layer. Once all the paper napkins have thoughrly dried, using a sanding block sand off excess paper from the edges. 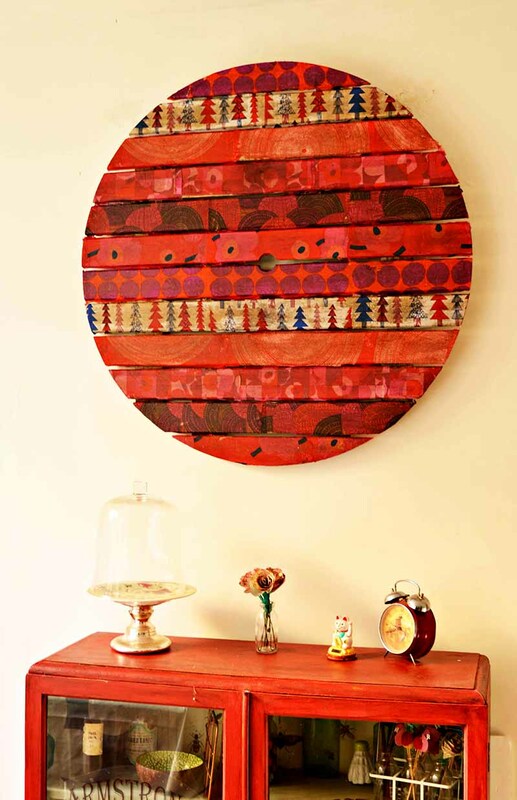 This piece of upcycled Mid-Century modern style Christmas wall art is really easy to hang on the wall. I just rested it on 2 strong wall hooks. 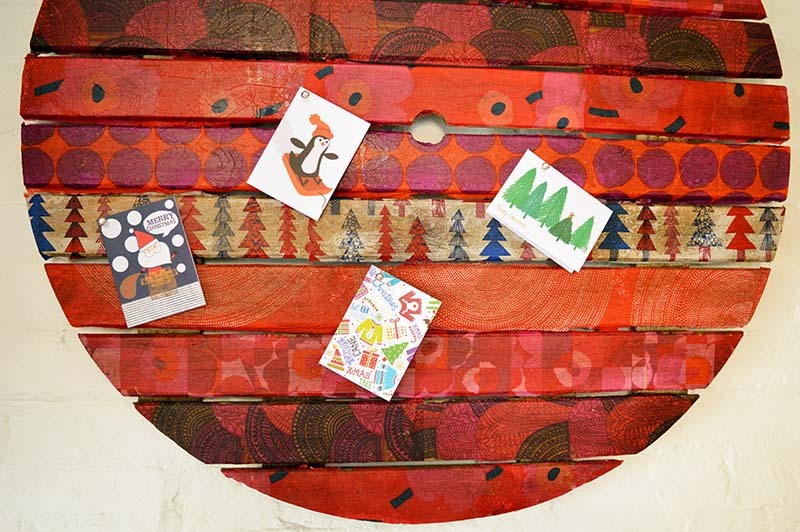 The Christmas wall art also doubles up as a handy pin board for Christmas cards. Do you ever get distracted when crafting and end up making something you had no idea you wanted to make? Thank you. 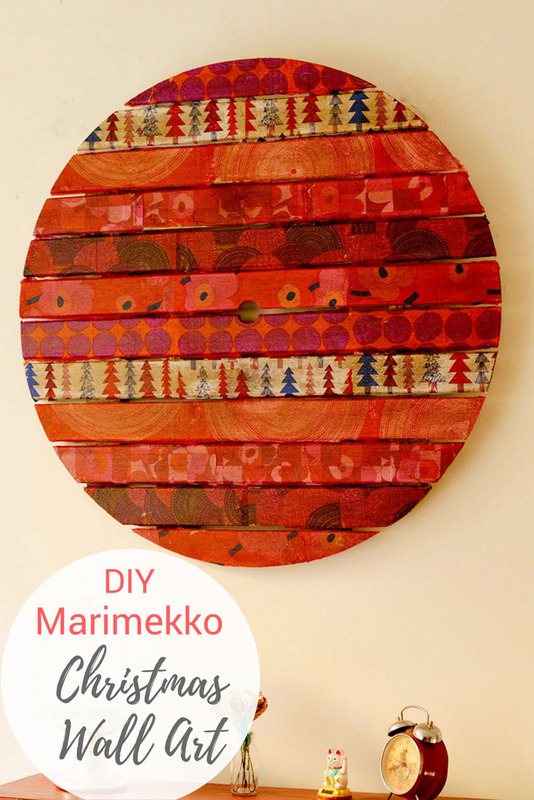 If it’s a Marimekko craft then the chances are it’s one of mine. I love it on my wall and I think I’ll keep it up all year round. Such a cool idea Claire!! Love that you used an old tabletop!! Thank you, Donna. I do like it on my wall I might actually keep it up all year round. Your wall art is beautiful and amazing!! 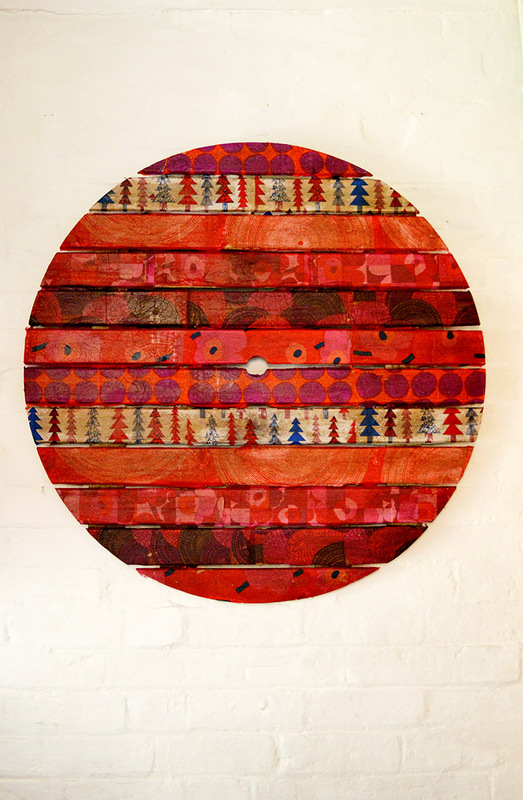 I wish I had a wooden circle that I could turn into art. But I don’t . . . I’ll see if I can find something else . . . Thanks so much for sharing at our Party in Your PJs. Thank you, keep your eyes open you might find one in a skip(dumpster). Claire, what a stunning piece! Shared to my FB page. This is awesome. Thanks so much for joining the To Grandma’s House We Go link party! I really love this! I think it’s beautiful. I’ve pinned it to my Christmas Creations board and though I’ve never tried mod podge, I am definitely going to try something like this! Thank you for sharing at Party in Your PJ’s. I look forward to seeing what you have planned for next week! Thank you, Teresa. 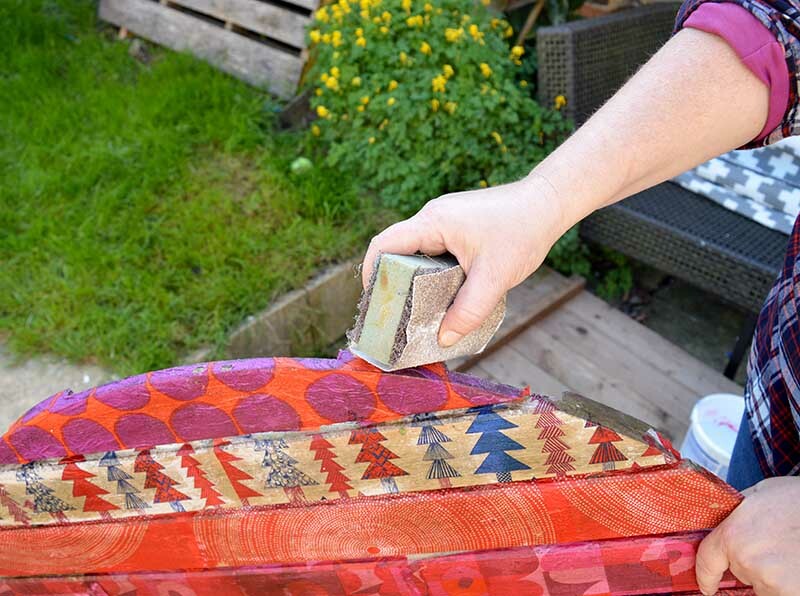 Using napkins and Mod podge is a great way to add colour and pattern to something that needs a bit of life, it is surprisingly effective. Thank you, Lins. I just love making stuff. So creative, Claire! Thanks for sharing at Vintage Charm! What a great idea 😁 It’s amazing what you can do with a bit of creativity. Thank you, yes it was quite a transformation. Thank you, I saw or it as a bit of a challenge. In answer to your last question… yes, all the time! The art is gorgeous btw, another magnificent project! And I’m thinking it could work quite well on a smaller scale too, I’m not sure we have space for a table on any walls round here, but maybe scaled down… my mind is whirring! Thanks, Julie. We have a lovely local Thai takeaway and they even send us a Christmas card every year! 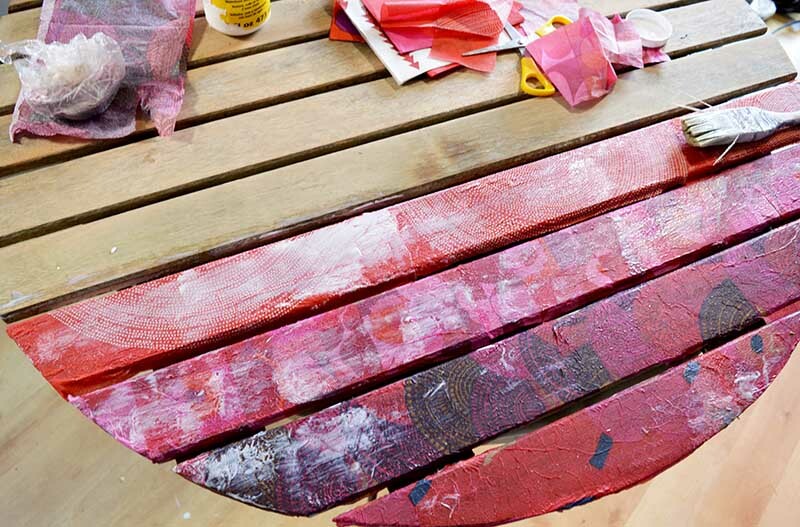 You’ve given that tired table top a colourful new life! I like the idea of using it as a pinboard for Christmas cards. Thank you, it does make a handy pin board. Great project. I love the bright colours. A nice way to display the cards too! Wow, so imaginative! Love a good upcycle! Thank you, it does make a fun card holder. I don’t think I had quite appreciated how big this wall art was until I realised it was a table top! Looks so well made, and the tutorial is easy to follow! Thank you, so much it is huge! Super cool! Can’t wait to try this!